Target, Heartbleed, and IE have all of us thinking about data security quite a lot. But then comes the prompt to change our passwords and we shrug, struggle, and attempt to shirk it. It feels like that prompt comes around too often, doesn’t it? We struggle to think of a new password. Then we have to follow the password strength requirements, such as having a capitalized letter, special character, number, and more than a certain number of characters. How do we keep it straight? We all know it is good for you to change your password, yet we all wish we didn’t have to! Kind of like eating your vegetables (at least when you were a kid). Passwords are absolutely necessary to ensure your intellectual and confidential property is safe. Everyone must participate in the process of changing passwords, and that means EVERYONE. Otherwise, you are the weak link in the organization. Where it gets tough is when the IT department gets the plea from an executive asking to skip the password change, just this one time. This is the most dangerous link in the chain, since it is the executive who likely receives the most confidential materials on the team. IT department: stand tall and enforce the policy. For the good of the organization. 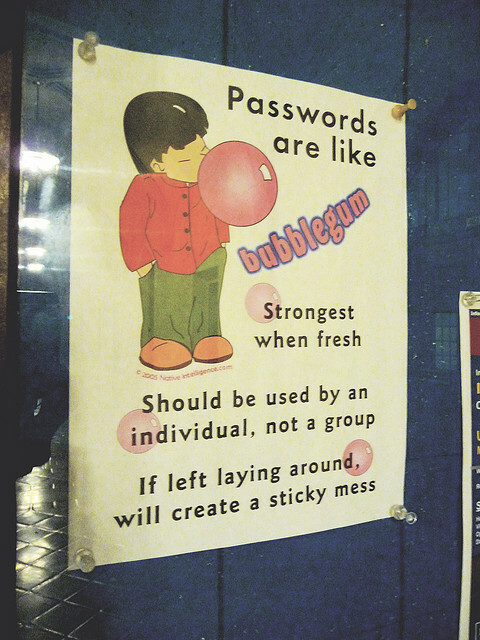 Need tips on selecting a password? Read Dan Lautman’s entry on password dos and don’ts. Looking for more information about information security? We’ve got you covered. Check out our infographic Is Your Organization Protected From Cybeattacks? for more information on threats to your organization’s security and how you can prevent your data from being compromised.